Le Malade imaginaire + CD audio more.. Le tour du monde en 80 jours + CD audio About the series : The series Lectures ELI Seniors is divided into 6 levels according to the language level of the readers. It's in line with the indications of the Common European Framework of Reference for Language and comprise useful language certification exercises. This ensures that learners will meet...more..
Bel-Ami + CD audio About the series : The series Lectures ELI Seniors is divided into 6 levels according to the language...more..
Candide + CD audio more..
Cyrano de Bergerac + CD audio more..
Manon Lescaut + CD audio About the series : The series Lectures ELI Seniors is divided into 6 levels according to the language level of the readers. It's in line with the indications of the Common European Framework of Reference for Language and comprise useful language certification exercises. This ensures that...more.. Le Grand Meaulnes + CD audio more..
Carmen + CD audio About the series : The series Lectures ELI Seniors is divided into 6 levels according to the language level of the readers. It's in line with the indications of the Common European Framework of Reference for Language and comprise useful language certification exercises. This ensures that learners will meet...more.. Le Rouge et le Noir + CD audio more..
20000 lieues sous les mers + CD audio more..
Germinal + CD audio About the series : The series Lectures ELI Seniors is divided into 6 levels according to the language level...more..
La tulipe noire + CD audio About the series : The series Lectures ELI Seniors is divided into 6 levels according to the language level of the readers. It's in line with the indications of the Common European Framework of Reference for Language and comprise useful language certification exercises. This ensures that...more..
Paul et Virginie + CD audio About the series : The series Lectures ELI Seniors is divided into 6 levels according to the language level of the readers. It's in line with the indications of the Common European Framework of Reference for Language and comprise useful language certification exercises. This ensures that...more.. 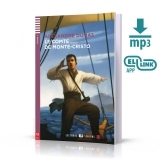 Le Comte de Monte-Cristo + Mp3 audio About the series : The...more..
La Chartreuse de Parme + CD audio About the series : The series Lectures ELI Seniors is divided into 6 levels according to the language level of the readers. It's in line with the indications of the Common European Framework of Reference for Language and comprise useful language certification exercises. This ensures that learners...more..
Madame Bovary + CD audio more..
Notre-Dame de Paris + CD audio About the series : The series Lectures ELI Seniors is divided into 6 levels according to the language level of the readers. It's in line with the indications of the Common European Framework of Reference for Language and comprise useful language certification exercises. This ensures that learners...more..
L'Éducation sentimentale + CD audio About the series : The series Lectures ELI Seniors is divided into 6 levels according to the language level of the readers. It's in line with the indications of the Common European Framework of Reference for Language and comprise useful language certification exercises. This...more.. Le Père Goriot + CD audio About the series : The series Lectures ELI Seniors is divided into 6 levels according to the...more..
Les Misérables + CD audio more..